The story of competing entrepreneurs in Birmingham during the industrial revolution. The more ‘Euro’ style of game doesn’t usually get a huge amount of attention on the EOG, but I do enjoy a finely crafted game of any stripe, as long as it’s clever and immersive. 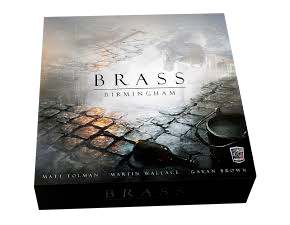 And Brass: Birmingham is one of those games that manages to not only impress with its clever systems, but also make you feel like you’re in the thick of its theme: in this case the grimy, smelly, smoky world of the industrial revolution 1770-1870, surrounded by your very own dark satanic mills. It helps that this is one of the most beautiful games I’ve ever seen, with such indulgent touches as day-time and night-time boards (which one you use is purely an aesthetic choice) and, in the Deluxe Edition, some lovely solid, chunky, heavy poker chips as money. I defy you not to manipulate these chips in your hand as you unravel the complex web of connections and industries you and your friends are building in your quest for economic dominance. A stunning game which should probably have a place in every gamer’s collection.